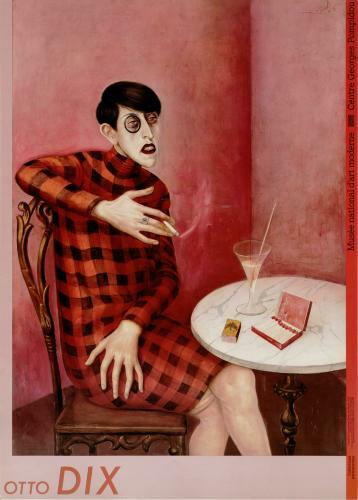 Living in Berlin between 1925 and 1927, Otto Dix painted a series of portraits typical of Neue Sachlichkeit (the New Objectivity). In them he makes reference to such early 16th-century German masters as Grünewald, Cranach and Holbein, not only in the technique – tempera on wood – but in the uncompromising character of the depictions. The journalist Sylvia von Harden is shown here sitting alone, in role of the emancipated woman intellectual she sought to be in 1920s Berlin, her nonchalance somewhat unnatural, the disdainful self-possession of the face contradicted by the writhing hand.